The man from North Shore, Oahu, Hawaii has been labeled a modern master of soft acoustic folk and surf rock but that doesn’t really explain his worldwide appeal. An ear for the irresistible – whether in the vocal delivery or the construction of a pop hook – may account for his success. It could just be the whole package. With six discs under his lean belt, a number of EPs, downloads, surfing movies and soundtracks, the odd remix album and a host of singles that have soundtracked the last two decades, Johnson is one of the most recognizable cats in the business. Devilishly handsome, totally committed to surfing culture, eco-green warrior issues and family – he has won awards for his main work as well as Humanitarian and National Conservation – Jack is one of the most level-headed of characters who packs plenty into his schedule while keeping his feet on the ground; that’s when they’re not on a board, hanging ten. So, here is a beach boy for sure, but never a beach bum. Time’s too precious to waste and he wouldn’t have got from then to now without putting in the hard yards. His album triumphs include the debut Brushfire Fairytales, On and On, the mega-selling In Between Dreams, Sleep Through the Static – well all of them really since, in the current decade, To the Sea and From Here to Now to You have topped both the UK and US charts, as well as those in Canada and Australia. Generally utilising a small but dedicated team of players and friends Johnson keeps it simple but maintains a deceptively persuasive line in lyric writing. Prolific with guitar and pen, he also tends to self-produce these days. His most familiar songs, from “Banana Pancakes” and “Good People” to “Upside Down” and “Better Together” all have the magic of the campfire; honest, inclusive and warm-hearted tracks that bring folks together. His albums are full of pleasure too and need to be discovered anew. Born in 1975 and raised on the North Shore of Oahu, where he still lives, Jack is the son of legendary surfer Jeff Johnson and was set to follow his father into the profession until an accident at the Pipeline sent him to the University of California, Santa Barbara to enrol in the film studies school. He graduated in 1997. Along the way he’d been playing guitar and writing as a youngster, absorbing the music of his favourites - Bob Dylan, Cat Stevens, Bob Marley, G. Love and Special Sauce, A Tribe Called Quest and Jimi Hendrix. Other ingredients that play a part in his sound are old school soulsters like Al Green and Otis Redding and even a bit of dub and Wu-Tang. In fact his first break was in having G. Love cover the song “Rodeo Clowns” on Garrett Dutton’s 1999 album Philadelphonic. Just before Brushfire Fairytales emerged Jack had directed the surf movie Thicker Than Water and still wasn’t sure where life might take him. Luckily his demos were impressive enough to persuade Ben Harper’s producer J. P. Plunier to stick Johnson in a studio with his rhythm section of drummer Adam Topol and bassist Merlo Podlewski, the trio having spent months living on the road together in a camper van. Their rapport and camaraderie shone through Brushfire Fairytales. It starts with “Inaudible Melodies”, a reference to the singer’s laid-back, not to say reticent persona in the early days, and includes some lovely gems like “Flake”, with Harper on pedal steel. Only a minor hit, as a single, “Flake” still became a signature tune and live staple. The equally impressive “Drink the Water” is a reference to his accident but also a face up to your fears type song. Over the course of his career the debut has gone Platinum in the U.S. and Gold in the UK. Moving to Universal in 2002 Johnson made his second album at The Mango Tree in Hawaii and really hit pay dirt with immaculate acoustic wonders “Wasting Time”, “The Horizon Has Been Defeated” and the cautionary “Taylor”, about a small town girl whose life goes off the rails. Those cuts and club honed ditties such as “Cookie Jar” and a reworked “Rodeo Clowns” confirmed the arrival of a major talent with a voice as hypnotic and tranquil as a long-observed ocean. Just as the record buyers flocked to this luscious sound so did fellow musicians. The Black Eyed Peas interpolated his song “Gone” as “Gone Going” on their disc Monkey Business and since that album would sell over ten million it’s a safe assumption that Jack was now in clover. The famous Brazilian producer Mario Caldato, Jr. (Beck, Tone Loc, Seu Jorge, Super Furry Animals et al.) brought his measured sense of rhythm and sonic warmth to the table for 2005’s In Between Dreams. The success of this fine set – it remains a go-to disc in the UK – can be traced to the infectious energy of “Better Together”, which samples Hoagy Carmichael’s “Heart and Soul”, the socially conscious “Good People” and “Breakdown”, written en route to the French resort of Soorts-Hossegor, one of the best surfing locales in the world. In fact the latter track had already snuck out a year earlier on Handsome Boy Modeling School’s White People album. The Grammy nominated “Sitting, Waiting, Wishing” is one of Johnson’s best feel-good about yourself buddy numbers. “Constellations” is a cosmic tune penned while long boarding in California at sunset. Elsewhere Jack’s interest in Kurt Vonnegut and Joseph Campbell makes its mark and the artist’s strong moral code, never hectoring, filters throughout. Having completed the soundtrack album, Sing-A-Longs and Lullabies for the Film Curious George (yet another chart-topper also featuring Ben Harper and G. Love) JJ reunited with Plunier for Sleep Through the Static (2008). Cool thing about this is it was recorded using 100% solar energy at L.A.’s Solar Powered Plastic Plant, direct to tape. Acknowledging his fan base in the UK Jack premiered the album on the BBC two months before worldwide release. “If I Had Eyes” was the teaser single, inspired by his son’s love of soya milk on one hand and aged up to take a glance at the perils of divorce on the other. 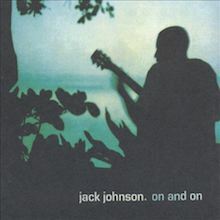 The cover of the album depicts a recently crop haired Johnson playing an electric guitar and sitting on a stool – very jazz, very smooth. The title cut is a veiled number about the Iraq War while “Hope,” recalls his love of reggae with a lilting, light ska-beat and trippy rhythm. Another hugely popular release, Sleep Through the Static is a five star item from top to toe and thoroughly commended for discovery. To the Sea (2010) is a band production with Zach Gill’s various keyboards fleshing out Jack’s most electric album to date. The chilled, summertime surf folk rock elements are still here of course but so also are riff based tunes – check “You and Your Heart” - where the strummy, chordal atmosphere is replaced with kick and rush adrenalin. On “At or with Me” Johnson addresses those who criticise him for being Mr. Mellow. That’s G. Love returning to add a tasty harmonica lick. Whether the detractors are right or not (they’re wrong) To the Sea delighted his fans and topped charts from Wisbech to Wellington. Back in his two solar-powered studios, in Hawaii and Los Angeles, Johnson sounds relaxed and completely in charge of his songwriting muse. Family songs (“My Little Girl”) pull the heartstrings; tougher love arrives during “Anything but the Truth”. Another sunny delight, albeit flecked with occasional darker clouds. The two live releases, En Concert and Jack Johnson and Friends Best of Kokua Festival showcase a different side of the band. The latter is particularly interesting since it contains collaborations with Eddie Vedder, Jackson Brown, Taj Mahal and the godlike Willie Nelson, who is joined by Jack and Ben Harper for a gorgeous take on “Blue Eyes Crying in the Rain”. The sheer variety on this disc allowed it to figure on standard charts and the US Top World list. So we come to the most recent disc, the essential From Here to Now to You. This heralds a return to the rootsier sound of the early Brushfire years with a sweet downhome vibe backing up the delicious “Washing Dishes”, “Tape Deck” and “Don’t Believe a Word I Say” – folk rock incarnate for today’s market and food for thought for those who think that all the good music has already been made. Jack is currently deep in the studio with the doors locked and the blinds drawn working on his new album. He’s unlikely to hurry, hasn’t done much of that yet, but it will be worth the wait for the chance to whoop Aloha. It took Jack Johnson two years to break into the mainstream with his debut album, Brushfire Fairytales, and by the time it went platinum in early 2003, his star power was unstoppable. Twentysomethings and college kids across the globe often compared Johnson's comfortable approach to the fiery Ben Harper, so when it came time to make a second album, Johnson basically picked up where the first album left off. On and On is a sparkling sophomore effort, carefully designed to avoid any kind of critical slump. Fans will enjoy Johnson's soothing ballads and boy-next-door charms, never looking beyond the surface of the songs themselves. Producer Mario Caldato, Jr. (Beastie Boys, Jon Spencer Blues Explosion) hones Johnson's feel-good vibe and polishes his signature acoustic guitars, while the musician himself continues honing his genre-blending sound. Johnson gets serious this time, too: he playfully expounds on America's sickening dependence on material things ("Gone") and its subconscious ill will with today's youth ("Cookie Jar"). Other views on world war ("Traffic in the Sky") and a capitalistic, business-obsessed way of life ("The Horizon Has Been Defeated") are gently reflected upon without reproach. Johnson doesn't need to be an aggressive messenger to get his point across; the sales of Brushfire Fairytales make that quite clear. Instead, people listen to Johnson's musical commentary because he puts himself on their level, shunning the philosophical preaching of his counterpart, Harper. On and On keeps things simple in sound and time, and the only noticeable change is that Johnson didn't lyrically restrain himself. There are 17 solid tracks featured here, each one of them rooted in spiritual grooves,funk, and blues. In dire times, Johnson is sunny -- and sunny always feels good. 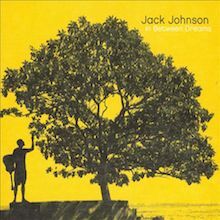 Singer/songwriter Jack Johnson writes songs that just feel good, sticking to an equation that combines his warm, relaxed voice with an acoustic guitar. That cozy formula made him a favorite among American college crowds, so it's no surprise that Johnson sticks with what he does best for his third album, In Between Dreams. Producer Mario Caldato, Jr. is back again, touching up Johnson's summery backdrop for another playful set of songs. The genre-blending charm and sweetness that fueled Brushfire Fairytales and On and On hasn't changed that much, but does it really have to? Johnson, alongside drummer Adam Topol and bassist Merlo Podlewski, makes safe records. While there isn't anything wrong with that, taking a few more risks sonically and lyrically wouldn't work against him. Tender moments such as "If I Could" and "No Other Way" showcase a more reserved side on In Between Dreams. Other highlights include the lullaby-like "Breakdown" and the bossa nova rhythms of "Do You Remember." Whether he's singing about being in love -- which he does quite well on "Better Together" and "Banana Pancakes" -- or reflecting on its hardships, Johnson's laid-back approach is his biggest strength. In Between Dreams is a bit brighter and more upbeat, but his song remains the same. 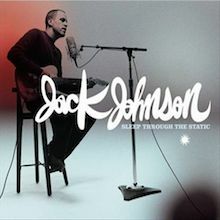 Much of the press surrounding the release of Sleep Through the Static recounted Jack Johnson's claim that he gave all his peppy pop tunes over to the Curious George soundtrack and how that, combined with personal losses -- including the death of his cousin Danny Riley, to whom the album is dedicated -- led the surfing singer/songwriter into darker territory for his fifth album. To a certain extent, all of that is true, as the album does open with an atypically stark, moody number in "All at Once" and there are some darker sentiments lurking within the 14 songs here, but it takes some close listening to find the sorrow flowing through some of the words. Some very close listening, really, as Johnson's sand-brushed, gentle voice doesn't command attention. His voice lulls and soothes, so it takes concentrated effort to hear beyond his tone and hear what he's actually saying. Then again, the meaning of Johnson's music doesn't matter as much as the mellow mood, a feeling that he's sustained throughout his albums and doesn't change here. Johnson may use more electric guitars than acoustics on Sleep Through the Static, but he's strumming them like acoustics and his overall aesthetic has not changed at all: he's still a laid-back guy singing songs that roll so easy they glide into the background. No matter what instrument he's playing or what he's singing about, his music still feels the same, which is enough to satisfy his fans but not to win him many new ones. 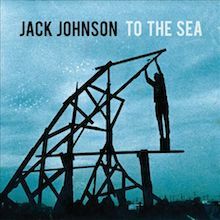 Jack Johnson quietly turned into a star over the course of the 2000s, so it’s only fitting that he inaugurates the second decade of his recording career with To the Sea, an album that feels like the work of a soft rock superstar. Of course, that’s what Johnson is, but he’s avoided sounding that way by performing soft-shuffle acoustic numbers, camouflaging his pop move as a soundtrack to Curious George, then getting mellowly introspective on 2008’s Sleep Through the Static. To the Sea blows away the drowsy cobwebs from Sleep, pushing the acoustic guitar to the background and letting his band groove politely, usually in an amiable, unhurried gait that never breaks a sweat even when the musicians goose the tempo a bit. Call it the signature of a surfer so bleached by the sun that he rushes nothing, but To the Sea substitutes the sunset strum-alongs of his earliest records for a sleek daytime sheen that might glimmer too brightly for hippies but it makes for a better overall pop record, the kind of album that suits Jack Johnson’s stature as surfer turned AAA crooner. 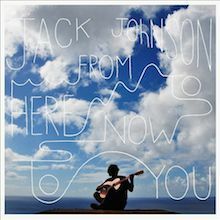 On his 2013 album From Here to Now to You, the surfing soft rock superstar Jack Johnson continues the subtle shift in his sound that began on his previous album, To the Sea. Like he did there, Johnson again spices up the sweet and sleepy acoustic ballads that are his claim to fortune and fame with some songs that have a little more bubbly, uptempo pop in their DNA. He and his able band put some surprising bounce in lighthearted rockers like "Shot Reverse Shot" and "Washing Dishes"; give his tale of playing in punk bands as a teen, "Tape Deck," a nice shaggy loping feel; and get almost funky on the jam band-friendly "Radiate." These tracks give the album a few nice jolts of energy, though jolt may be the wrong word. Maybe more like gentle nudges. Certainly not drastic enough to detract from the reliably mellow mood Johnson creates on the rest of the album as his quiet and peaceful tunes work like a shot of musical melatonin. Songs like the sweetly romantic "I Got You," the gently questioning "Don't Believe a Thing I Say," and the truly lovely ballad "Change" are like melodic cocktails guaranteed to give you a light and breezy buzz with no hangover the next day. When he gets a little melancholy, which he does a couple times, he does it in such a pleasant way that the slightly dark sentiments float by like stray clouds. Only one song lets down the side, the treacly and slightly odd ode to parenthood "You Remind Me of You," which equates children with clones and sounds way too silly compared to the rest of the record. This one stumble aside, From Here to Now to You is another impressive record from Johnson. The way he mixes sounds, styles, and moods on the album is, like it was on To the Sea, a nice step in the right direction; the songs are typically strong; and the whole thing goes down as easily as ice-cold soda pop on a hot summer day. Jack Johnson is such a big deal in his native Hawaii that whatever guests he hires to appear on his Kokua Festival can follow his rules. At the very least, he's gotten Jackson Browne to rewrite part of "Take It Easy," giving the "Winslow Arizona" verse a distinctly island spin. 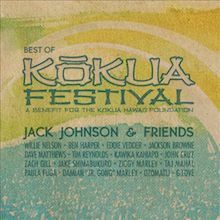 This is the most overt display of deference on Jack Johnson & Friend: The Best of Kokua Festival but it's hardly the only moment where Johnson is clearly the Big Kahuna, nor is Browne the biggest star here. Eddie Vedder stops by, along with many other rockers and guitar strummers of all stripes, and there is a sense of communal good times that's palpable and often ingratiating, even to those who don't quite cotton to Johnson's notion of surf-n-sun good times. Even here, where he is quite clearly the ringleader, Johnson remains an affable but not forceful presence on record: Browne, Vedder, Willie Nelson, even Dave Matthews and Ben Harper, all easily overpower him. And yet there's no question that this is his party: his sweet, accommodating nature is evident throughout these cuts, so much so that they may elicit a smile from the sour doubters who've never found a reason to like his studio records. 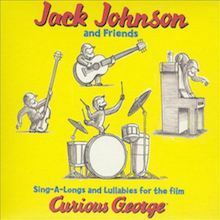 Perennial surfer dude/singer/songwriter Jack Johnson lends his voice to the eternally silent Curious George on this collection of "Sing-A-Longs and Lullabies," original material built around the famous monkey and his strange obsession with "the Man with the Yellow Hat." Universal Pictures couldn't have picked a better collaborator for this soundtrack to the Curious George film, as Johnson's easygoing delivery and breezy demeanor match George's silent curiosity to a T. Fellow songwriters Ben Harper, G. Love, and Matt Costa contribute three songs to the predominantly children-oriented affair, while Johnson and band give up an island rendition of the White Stripes' "We're Going to Be Friends," as well as the umpteenth cover of Schoolhouse Rock! 's "Three Is the Magic Number." Heady stuff? Not exactly, but there's not an ounce of pretense to the project, making it a fun, safe bet for kids and a forgettable -- yet not entirely unpleasant -- piece of escapism for adults. Die Rolling Stones gehen On Air – wie wir sie noch nie gehört haben!